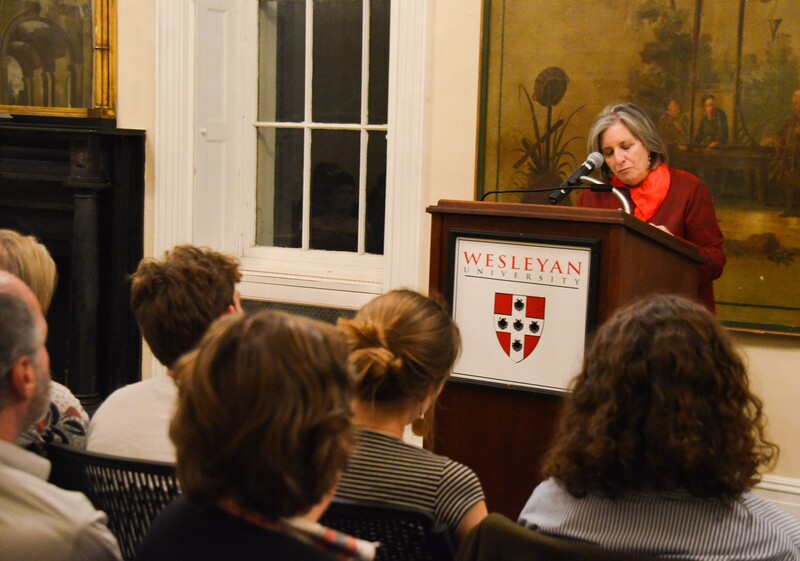 “I’m still working on the tall thing,” Mary Gordon joked as she stepped behind the podium at Russell House this past Wednesday. The Joan Jakobson Visiting Writer read excerpts from her novel “There Your Heart Lies,” which tells the story of both Marian, a woman who volunteers for the Spanish Civil War, and her granddaughter, Amelia, a young woman with an uncertain future and an interest in her grandmother’s past. Gordon began by giving the audience some background about the Spanish Civil War, without any notes, it should be added, and without pause. She explained the war as a right-wing coup headed by Francisco Franco perpetrated against the left-wing government. While European countries were legally bound in a pact to remain neutral in foreign affairs, both Adolf Hitler and Benito Mussolini broke this pact and supported Franco. The left, however, was without aid, until Joseph Stalin agreed to arm them. Gordon described this as a devil’s bargain, which viewed the Russian dictator as a sort of necessary evil. The moral confusion only increases from here, due to divisions within the left between anarchists and communists. Gordon grew up in a conservative Catholic family, where she was taught that Franco was a hero because he held back communism, and communists raped nuns and killed priests. While traveling in Colombia, she was told a radically different story. She was told that the Lincoln Brigade of communists were all idealistic gentlemen. Then she read “Homage to Catalonia” by George Orwell, who claimed the communists were complete tyrants; instead, he favored the anarchists, who he viewed as idealistic and pure. The reality of this complex war, like most other conflicts, was that no one was completely free of blame. This is where the literary writer-side of Mary Gordon shows up. She had received three different narratives. “All of which couldn’t be true, but couldn’t be completely false, either,” said Gordon. She instead found herself admiring those who could step back and see atrocities from a multitude of sides—to be able to see nuance in history and current events, and have that viewpoint produce empathy. It is this moral moment that she sought to explore in her novel. Gordon’s commentary was perhaps even more illuminating than the novel excerpts themselves. Every phrase she spoke sounded like both a revolutionary idea and a call to action, particularly in our political climate. In the novel, for example, protagonist Marian’s beliefs are often purely oppositional; all she knows absolutely is that there is evil on both sides. “Sometimes one thing is so bad that the best you can do is the less bad thing,” said Gordon. This rang particularly true in reflecting on the last presidential election. “To wait for a kind of purity, to wait for some leader who is without flaw, that can lead to a kind of paralysis,” she said. Gordon labels this a problem that distinctly plagues the left. During the Q&A portion of the evening, Gordon discussed how she is able to continue writing new and interesting things, even after her 40-year career. The room sat silent, lost in Gordon’s train of thought. “I guess that’s my particular little allergy,” she joked. We all laughed, perhaps some of us in bitterness: our allergies make our eyes itch. They don’t produce striking novels.